This talk and film show is by Reel Lewes, a small group of local film-makers, researchers and writers who have been investigating the history of cinema-going in Lewes over the last two years, and will cover the research process and outcomes of this oral history project. It includes some of their findings, both from Ruth Thomson’s book Screen Stories – Lewes goes to the pictures (published on 27 May) and from their film, Big Screen Memories. The film extracts you will see show local people reminiscing about the two long-gone cinemas in Lewes: the Odeon and the Cinema de Luxe. This 1920s postcard by Averys of Brighton, showing the view down School Hill and featuring the Cinema de Luxe, was offered for sale on ebay in April 2017. The Cinema de Luxe was the second of the three Lewes cinemas that were the predecessors of the new Depot. Horsfield arrived in Lewes a full generation after Paine’s departure, but as memories are long in a county town he will have known residents who did know Paine personally. “1767. About this time Thomas Paine, who has made so much noise in the world as a writer, was stationed in Lewes in the excise and surveyed the upper part of the town. I recollect his person very well, as I often saw him surveying the shop of Messrs Brett and Whitfield, where we went to fetch goods. He appears to me to have been about 5 ft 8 or 9 inches high. A round hat, bushy wig and oval face, straight made. Bat legs and thighs. Married Miss Olive, the only daughter of Mr Olive, the tobacconist at Westgate. I remember my mother and Dame Brown having a curious conversation about the Marriage. Dame Brown (afterwards Hayler) had lived with Mr Olive as a servant and had just been to pay her young mistress a visit, about a week after her marriage with T. Paine. Recollect Mr Olive but not much about the daughter. Source: Andrew Lusted, ‘The Book of Wisdom’, part 1, pp.19-20; the memories written down in his old age of William Wisdom (1756-1843), who lived in Glynde from his birth until his wife died in1818, but then left the village to live with a daughter in London and East Anglia. The constables and headboroughs of the old borough of Lewes were exclusively male, but the incorporated Borough founded in 1881 had a number of female councillors. However, only two women were ever appointed Mayor of Lewes before the incorporated borough was disestablished in 1974: Anne Dumbrell was made mayor in 1963 and Beatrice Temple in 1972. Anne Dumbrell was the headmistress of the St Anne’s Special School, which opened in 1952 in the premises on De Montfort Road formerly occupied by the St Anne’s Church of England School, a former National School for that parish, which had closed in 1951. In the 1960s the Special School was moved to the former Southover Rectory, on Rotten Row, a building that has disgracefully been abandoned to lie derelict since the school’s closure. “The old church was an ancient edifice, consisting of a nave and two aisles. By length of time it had become so ruinous that the inhabitants could not attend divine service therein without great danger of their lives. A survey being made of the premises, by several able ad experienced workmen on oath, and an estimate of charge of rebuilding same being drawn up, it amounted on a moderate computation to upwards of £1,366. Under the harsh regime of the New Poor Law (introduced by the 1834 Poor Law Amendment Act) anyone falling ill or becoming unable to work could only get support for their family by entering the prison-like Union workhouses. This led to a proliferation of local Friendly Societies offering mutual insurance, often based on public houses. Not all the local people who took on their management proved up to the job. The main problem with Friendly Societies was that as the members aged, they became more likely to suffer illness or disability and thus make claims. Young men, observing this, declined to join existing societies with an ageing membership. Instead they started their own new society, excluding their higher-risk elders – or indeed other young people whose state of health or character was suspect. Contemporary insurance-based health schemes, including Obamacare, still suffer from this same problem: they get very expensive unless high risk members are excluded. Apparently President Trump has a solution to this age-old problem, that will enable him to keep the best features of Obamacare (such as universal eligibility) while slashing the cost. John Smithson’s excellent talk to us in April featured the Lewes-born artist Harrison Weir, who was born in the town in 1824. Harrison Weir’s father, John Weir, was from Stanhope, county Durham. My earliest reference to him in Lewes is on 16 May 1809, when John Weir of Lewes, gent, was appointed as an ensign in the Sussex Militia by the Duke of Norfolk. Then in 1812 he stood as bondsman for the marriage licence for a Ringmer miller, whose father, Thomas Hill, was a Lewes miller and baker. From 1816-1819 and again in 1824 John Weir figures as an overseer of the poor for St Michael’s parish. In 1818 John Weir, Lewes, appears as a subscriber to a book of poetry ‘Joseph and his Brethren’, originally written by ‘A Lady’ but ‘corrected’ by Joseph Kirby, the minister of Cliffe Old Chapel, and printed and published by John Baxter of Lewes, the father of the colour engraver and printer George Baxter to whom Harrison Weir was later apprenticed. John Weir married Elizabeth Jenner of Warrs, Chailey, at All Saints church on 24 May 1821, a marriage that resulted in the baptisms at St Michael’s of John Jenner Weir on 12 September 1822 and Harrison Weir on 23 June 1824. After the death of Elizabeth Jenner’s father, her mother had left Warr’s in the hands of one of Elizabeth’s brothers and brought her daughters to live in East Street, where three of them married Lewes men of business. Elizabeth was the first to marry, but an elder sister married the solicitor John Webb Woollgar in 1822 and a younger sister married John Tattersall Auckland, Woollgar’s articled clerk, partner and eventual successor, in 1835. John Weir had two identified roles in the Lewes economy. 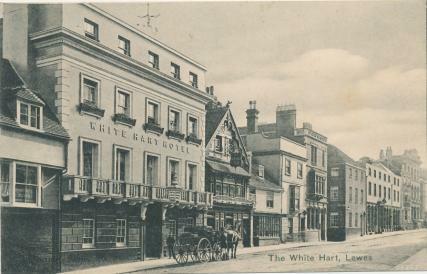 Firstly he was the manager of the Lewes Bank and lived at the Bank House, 58 High Street, the white three-storey house three doors along from the White Hart (55 High Street) in the Edwardian postcard shown. The 1821 marriage of John Weir of the Lewes Bank and Elizabeth Jenner was reported in the Oxford Journal. Secondly he was a Lewes coal merchant – an appropriate role for a county Durham man – working from Eastgate Wharf in partnership with Jesse Cooke. An 1823 deed by which John Webb Woollgar purchased 24 North Street has John Weir of Lewes, coal merchant, acting as his trustee. 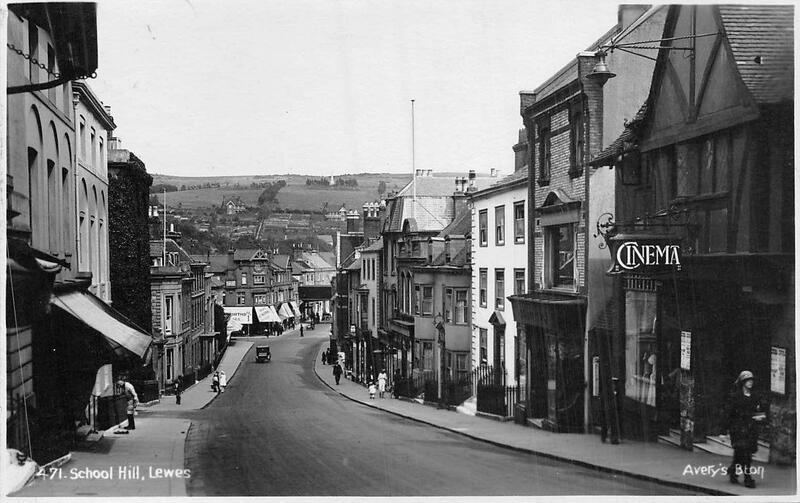 The Lewes Bank that employed John Weir was established in 1805 by four partners, John Wood of Southover, Nathaniel Hall of Southwick, Samuel Flint of Kingston and John Godlee of Lewes. It was a rival to the Old Bank further along the High Street at the site now occupied by its successor, Barclays. Both banks suffered runs in the December 1825 banking panic, but while the Old Bank just managed to survive, the Lewes Bank had to close. The crisis also swept away John Weir’s partner Jesse Cooke, who had taken out large loans to buy a Brighton milling business shortly before the crash. The 2 & 9 January 1826 Sussex Advertisers carried advertisements from John Weir that the partnership of Weir & Cooke, Eastgate Wharf coal merchants, had been dissolved, but that he would be carrying it on himself, while four months later another advertisement announced his disposal of the business. His brother-in-law’s law firm collected the debts owed to him. The Lewes Bank unwound its position over the following months, paying ten shillings in the pound in April 1826 and eventually repaying its depositors in full by 1828, but never opening its doors to new business again. Thus in 1826 both John Weir’s Lewes business ventures failed. His coal business was sold in the spring, while the bank that employed him had collapsed and liquidated its assets. John Weir of High Street, Lewes, acted as an executor in the last months of 1826 but then disappears from the town. He reappears a decade later as a London civil servant, living in Camberwell. Harrison Weir evidently felt strong associations with the town of his birth, but may not have actually lived here very long. His Jenner relatives of course remained prominent in and around the town. Richard Peters Rickman (1745-1801) was a successful Cliffe grocer, baker, brewer and banker, the son of John Rickman of the Cliffe (1715-1789), baker and brewer, and his wife Mary Peters. 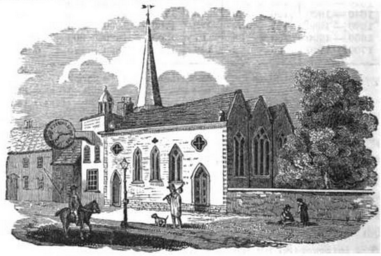 The Rickmans were Quakers, becoming the leading family of the Lewes Meeting. The headship of the family over six generations alternated between three John Rickmans and three Richard Peters Rickmans. As a Quaker Richard Peters Rickman was required to choose as his wife a Quaker women whose character had been approved by a specially established inquisitorial committee of female Quakers before a marriage at the Meeting House was permitted. Richard Peters Rickman ignored this requirement, marrying Mary Verrall, daughter of George Verrall, in June 1767 at Cliffe church without seeking the Friends’ approval. His conduct can perhaps be explained by the extremely prompt arrival of the first of their children. After due repentance of their crimes Richard Peters Rickman was formally re-admitted to the Society and his wife also became a Quaker. They are both buried in the Quaker burial ground on Friars Walk. Joel was stillborn and of the others the first Richard, the first two Anns, the first Samuel, Margaret & Sophia all survived birth but then died as infants or toddlers. This was well above the average infant casualty rate for the 18th century. The family owned the Bear Inn, and although they were financially prosperous their house in Bear Yard may not have been a particularly healthy location for babies, given the Cliffe’s notorious drainage problems. The 11 children who made it to their second birthday all survived to adulthood. John Rickman (1774-1859), the eldest surviving son, inherited the Lewes business. His elder sister Mary married a Quaker neighbour and became the mother of the prominent 19th century townsman Burwood Godlee. One of Elizabeth’s sons, the physician and pathologist Thomas Hodgkin, provided the first description of the malignant disease still known as Hodgkin’s lymphoma. The war memorial that was in the Lewes Crown Post Office, High Street, until it closed has been moved to the Royal Mail deliveries office on South Downs Road. I saw it there recently when collecting a parcel. This entry was posted in Art & Architectural History, Biographical Literature, Economic History, Family History, Lewes, Local History, Political History, Social History. Bookmark the permalink.